What do you first think of when you hear the word adoption? Most people think of horizontal adoption before they think of vertical adoption, that is, they think of people adopting children before they think of God adopting us as His children. Throughout this new series of posts on the importance of adoption within the story of redemption I am going to use the word adoption in two different ways. First, I will refer to the practice of people adopting children, both domestically and internationally, as horizontal adoption. Second, I will refer to God’s adoption of us as sons as vertical adoption. Horizontal adoption is one human being establishing a familial relationship with another human being. Vertical adoption is God establishing a familial relationship with human beings, His image-bearers. So what do you first think of when you hear the word adoption, earthly or heavenly adoption? Do your thoughts move vertically before they move horizontally? Or do they move horizontally before they move vertically? For most of us, our thoughts move horizontally before they move vertically when we hear or read the word adoption. 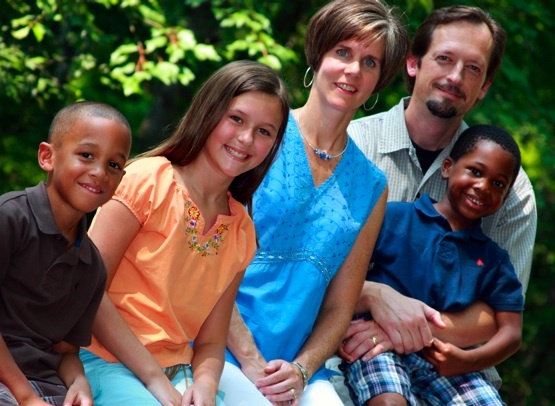 God has given me the great and wonderful privilege of being an adoptive father of a multi-ethnic family. We are, what the adoption community calls, a conspicuous family. God gave us our first two children (a girl and boy) through biology and our next two children, two black boys, Isaiah and Noah, through adoption. I absolutely love being the father of a multi-ethnic family! It has its unique challenges for sure, but it is a great joy to be a family that mirrors, in miniature and imperfectly, the multi-ethnic family of God. If you are parents of an adoptive family, you have been asked similar questions. But I’m convinced that fewer questions like the one above would be asked if our thoughts moved vertically before they moved horizontally. Why am I convinced of this? Because for Christians adoption is central to what defines us. The apostle Paul is very clear: we are God’s sons through adoption. I don’t know if you have ever thought about it like this, but God is an adoptive Father. Jesus, our Elder Brother, is God the Father’s eternal, only-begotten, natural Son. We believers are His sons through adoption. This identity is fundamental to who we are. As adopted son, we enjoy all the rights and privileges of the relationship that God the Father enjoys with His eternal Son. To be God’s sons through adoption means that we are co-heirs with Jesus. This is an amazing reality and eternal privilege! We will forever be God’s sons through the miracle of adoption. It is very important that we as Christians understand this: Adoption is vertical before it is horizontal. Vertical adoption is what God does; horizontal adoption is what we do. Adoption was invented by God even before He created the world (Ephesians 1:3-5). It is how God brings us into His family with all the rights and privileges of Jesus, our Elder Brother. As a result, we should see the earthly practice of adoption as a wonderful, though imperfect, reflection of God’s work of adoption in Christ. Read part 2. Read part 3.